The banking cartel, central banks and governments create debts – dollars, yen, pounds, and euros and inject them into economies. Those new currency units make existing units less valuable. They purchase less—called devaluation—and prices rise. The devaluation process accelerates every year and is unlikely to change (without a huge reset) because it benefits governments and the banking cartel. Prognosis: More devaluation is inevitable, along with higher prices. Potatoes, beer, political payoffs, postage, energy, stocks, crude oil, silver, trucks, hospitals, gold and thousands more. Graphs for other stock indexes look similar. They show exponential rises as created currencies (new debts) surged into stocks and levitated them. 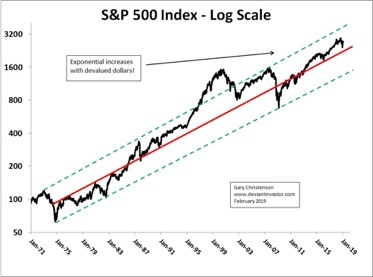 Note: The S&P 500 Index could fall to 1,600 in 2021 and stay within its channel. Stock prices increase exponentially as banks devalue currencies. Gold and silver prices rise similarly. 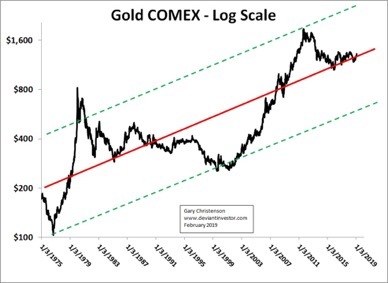 Gold and silver prices have remained within a five-decade trend channel (as drawn) except during the bubble in 1980 and the price crash after the stock market bubble in 2000. Note: Gold could rally to $3,000 in 2021 and stay within its channel. Silver could rise to $90. Silver is near the bottom of its trend channel. Stocks are over-valued and should fall for several years. Yes, cheerleaders believe stocks will rise forever, as they claimed in 1929, late 1999 and 2007. A different group of cheerleaders thought silver and gold would continue to rally past 2011. Prices will rise, but cheerleaders can be wrong on short-term direction. The risk/reward analysis in early 2019 suggests selling stocks and buying metals. WHAT DOES THIS PROVE? IS THIS A PREDICTION? The above analysis is not a mathematical proof or prediction. It is a demonstration of five-decade exponential price trends. 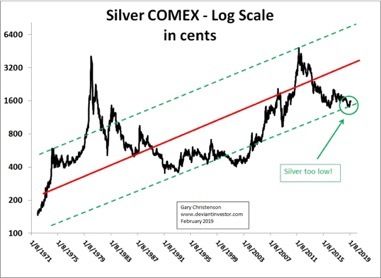 It shows that silver prices are near the bottom of its trend channel. They can fall lower but higher prices are more likely. Gold at $3,000 and silver at $90 in 2021 are possible. A dollar collapse, higher interest rates, excessive debt, trillion dollar annual interest expenditures, more war, political discord, MMT, a UBI, a socialist political revolution (larger deficits and far more debt) and escalating FEAR are likely. A levitated stock market could regress to its mean (lower).Gold and silver will be in demand as more individuals realize gold and silver have no counter-party risk, unlike debt paper, stocks and currencies. EXPECT HIGHER METALS PRICES AND LOWER STOCK PRICES! 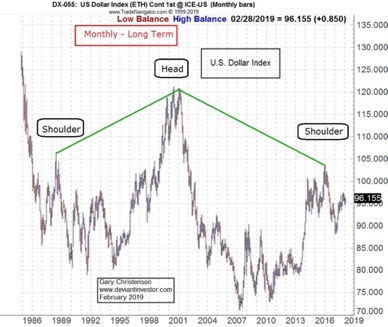 WHAT ABOUT THE DOLLAR AND THE DOLLAR INDEX? Dollars and other fiat currencies will fall in purchasing power. A pack of cigarettes cost 10 cents in 1913. Cigarettes cost $5 – $10 today. Other currencies could fall more than the dollar which would make the dollar index rise, even as consumer prices zoom higher. However, the dollar index chart is NOT positive. Consider monthly, weekly and daily charts. 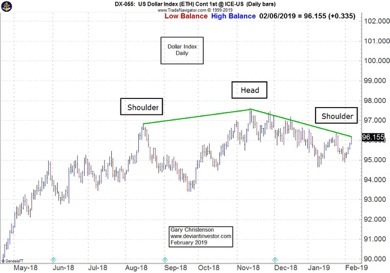 Those charts show potential “head and shoulders” tops. This bodes poorly for relative dollar strength. Expect dollar devaluation as debt explodes higher in the U.S. and expect relative dollar weakness against other currencies. Gold and silver prices will benefit from both. Gold (others reported) hit new highs in 72 other currencies. Prices for stocks and metals increase exponentially as the banking cartel and governments devalue fiat currencies. A reset is coming. Stock prices are now too high and metals are too low—after years of stock market levitation and metals weakness. Within five-decade trend channels the S&P 500 Index could fall to 1,600 by 2021, gold could rise to $3,000 and silver could rise to $90. More extreme prices are possible. The dollar’s purchasing power will continue to decline, as it has for over a century. 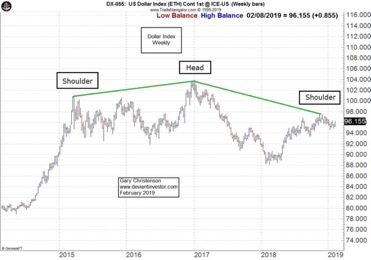 Relative to other unbacked currencies, the dollar index might plunge. A falling dollar index will boost gold and silver prices. Gold and silver are insurance against the predations of central bankers, irresponsible governments, socialist spending programs, counter-party risk, currency collapses, and a debt reset. We all need insurance. Miles Franklin sells “insurance policies” in the form of gold and silver coins and bullion. Recycle dollars from over-valued stocks into gold and silver before the reset. Expect tumultuous events in politics, economies and markets in 2019 and 2020.